Despite having dated a few high profile names in the industry, Jalen had failed to turn any one of them into a wife. That was to change with his latest girlfriend. The Detroit native is a former professional basketball player, currently working as a sports analyst for ESPN and also hosts NBA Countdown. Rose played in the National Basketball Association (NBA) for six teams, most notably on the Indiana Pacers teams that made three consecutive Eastern Conference finals, including the 2000 NBA Finals. He was primarily a small forward but sometimes played the role of a shooting guard. Since 2014, Rose serves as the official ambassador and spokesperson for the National Basketball Retired Players Association. Jalen’s personal life has always been controversial and mysterious. Born on 30 January 1973 he was raised by a single mother and his biological father was former NBA star, Jimmy Walker. Jalen got his name from a combination of two names, James and Leonard, his mother's father and uncle. Having left the family before he was born, Jalen did reconnect with his father through telephone conversations but did not get to meet him in person before his death in 2007. Does Jalen Rose Have Kids? He has three kids, two daughters, and a son. He is a proud father of a gorgeous teenage daughter, Mariah Rose born in July 2000 to his previous girlfriend, Mauri Goens. Apart from Mariah, he also fathers two other kids, a daughter Gracie, and son, LaDarius. However, the identity of the kids' mother has remained under the wraps. 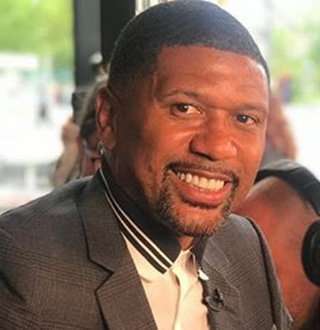 Jalen Rose was strolling around at the office just like a regular day until he stumbled unto a co-worker who stole his heart. Jalen met Molly Qerim, a moderator for ESPN's show First Take, during their time together at ESPN. After meeting and getting to know each other, they both grew fond of each other and started dating each other in 2016. Like any other relationships, Jalen has faced his fair share of ups and downs, in his relationship with his latest girlfriend. The biggest test of their love came when famous rapper Eminem mentioned Molly in his new track Campaign Track, among names like Donald Trump, and Robin Thicke. But, wisened by his previous relationship lessons, the former basketballer handled the situation brilliantly. Being an Eminem fan as well as Molly’s lover, he coyly reacted to the controversy. He didn’t see it as a disrespectful jab at her girlfriend. Instead, he saw it as a compliment from one of the greatest rapper of all time; he saw it as Eminem’s way of sending love to his girl. The way he handled the controversy in 2016 saw him win his girlfriend’s heart even more. After dating for so long, the girlfriend and boyfriend duo went on a vacation on the Turks and Caicos Islands. It was during their vacation they caught everyone by surprise as they coyly tried to slid in their engagement news on their Instagram account. On 14 July 2018, Molly shared pictures from the Turks and Caicos Islands cozying up with each other hinting that their relationship had taken to the next level. To the untrained eye, it was only just a romantic picture however to their dedicated shippers; it was an engagement post. The eagle-eyed fans saw Molly wearing a ring with a big shiny rock- an engagement ring, confirming the pair had engaged to get married. And Jalen and Molly's vacation at Caicos got even better as they treated fans with news about their wedding. After the news about their engagement slid away from most of the fans, they passed another emotional moment without the media’s knowledge. Jalen's newlywed wife Molly shared pictures of the duo on her Instagram on 21 July 2018, from their wedding. With both the couple perfectly complementing each other in a bright white wedding dress, it did not require a trained pair of eyes to deduce the fact that the pair had got married. The pair looked quite perfect for their wedding day. The pair had got married at an intimate ceremony at the Caicos. And the month of July got even better for Jalen's wife Molly as after getting engaged and married in a whirlwind scenario, she shared another good news. Taking to Instagram just three days after posting the wedding pictures, she announced that her show, First Take was going to relocate to the big apple, helping her be close to her husband Jalen.